Apollo’s Fire is also known as the Cleveland Baroque Orchestra, a lively and colorful ensemble that specializes in singing traditional Irish, British and Appalachian folk tunes and performing with traditional instruments. Jeannette Sorrell is the group’s founder and director. Sugarloaf Mountain is a wooded outcrop of quartzite left over from an ancient land mass, and is located in rural Maryland near the Shenandoah Valley of Virginia. 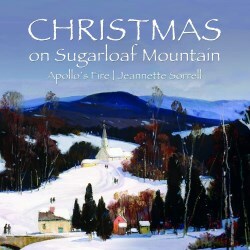 This album is Jeannette’s tribute to this unique part of Appalachia and the Christmas season. This album has a wide variety of holiday and seasonal folk arrangements. The opening medley features the lively traditional Irish ‘Christmas Eve Reel’ led by a team of fiddlers, followed by the New England favorite ‘Christmas in America’ and a banjo-driven ‘Old Christmas Eve’. Susanna Perry Gilmore is featured on fiddle, performing another medley: ‘Sheep Under The Snow’ – ‘Apples In Winter’ –‘Little Christmas Reel’ supported by the full Baroque Orchestra with the stomping feet of dancers on stage adding to the fun. Apollo’s Fire also has its own children’s choir, known as the Musettes. They sing several numbers including an interesting arrangement of ‘Ships in Full Sail & I Saw Three Ships’. Those who admire a good hammered dulcimer will greatly enjoy Tina Bergmann performing the medley ‘Frost & Snow’ – ‘28th of January’ – ‘Dominion Reel’ with a fine accompaniment from strings and flutes. Two of the more unusual vocal numbers on this disc are ‘The Shepherd’s Star’ and ‘Star In The East’, a hymn from the early 1800’s which originated in shape-note notation, and was first published in 1835 in the shape-note hymnal The Southern Harmony. They are sung accompanied by a single heavy drum beat keeping time. This music was recorded at First Baptist Church in Cleveland Heights, Ohio on December 5-9, 2017 and July 28, 2018. Daniel Shores was the recording and mastering engineer, and Jeannette Sorrell and Erica Brenner were the recording producers. The sound quality is very good overall, however the instruments overwhelm the vocals on a few numbers. A 28-page booklet provides interesting background information, photos, and lyrics.